gavarfali recipes. cluster beans recipe collection. Gavarfali, better known as Guar in India, is a legume that is annual in nature which is the source of Guar gum. It is native to India and Pakistan, mostly found in Maharashtra and Andhra Pradesh but due to its rapid demand, it is being produced in different parts of the world as well. The younger vegetables are harvested to be used as vegetables while the matured ones are used to produce guar gum. This gum is a very powerful thickening agent which is used commercially to thicken various food items like ice creams and sometimes as an additive like in cheese. These fibrous vegetable pods are a popular ingredient to cook with in India. In Rajasthan they are prepared in two ways, with or without gravy. Sukhi Gavarfali Subzi is a basic vegetable preparation with all the Indian spices. These spices have to be added in the order mentioned which will result in a flavorful preparation. The other Gavarfali Subzi has a light gravy of curd and besan with the taste of cumin and hing coming through beautifully. Gavar has to be cooked right in order to enjoy its taste properly. It shouldn’t be too overcooked or else it becomes bland. Add it to the famous Sindhi Kadhi along with an array of vegetables that are coated in a besan curry and enjoy with hot steamed rice. Gavar aur Masoor Dal might seem like an odd combination but it is surprisingly tasty. Tomatoes and onions help with the taste while garlic and hing provide an amazing smell! These are just some plain subzis that I mentioned but what people don’t know is that they pair fabulously with pumpkins. Gavar Pumpkin Vegetable is a healthy subzi for diabetics. Gavar helps in maintaining the blood sugar level while the pumpkin provides a slight sweetness to the gravy. What do you get when you combine Guar with bajra? You get a fiber rich, mouth-watering delicacy Gavarfali with Bajra Dhokli. If you want to know more about the Uses of Gavarfali, then you can check out our article on that. 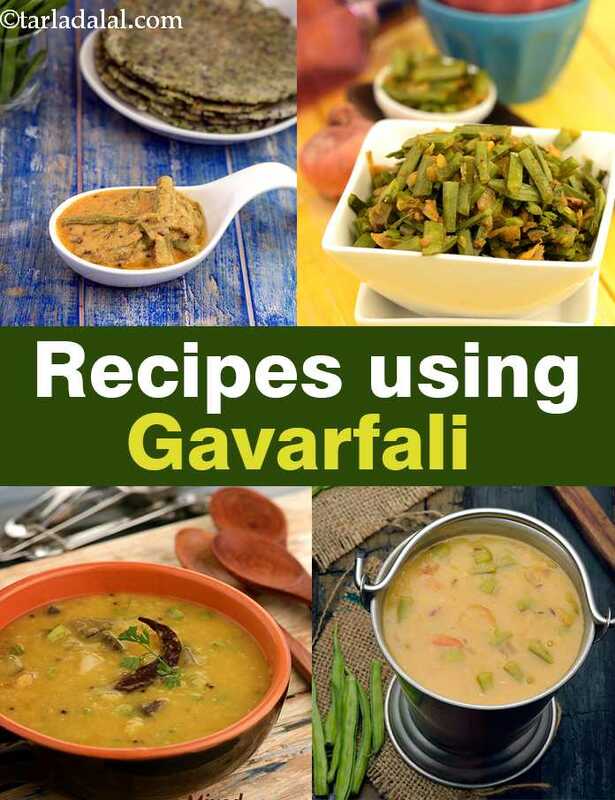 Enjoy our gavarfali recipes. cluster beans recipe collection given below. Sindhi cuisine is very nutritious with a predominant use of vegetables in each and every dish. Sindhi kadhi is one such example where all the vegetables are used beautifully to complement each other in taste, colour and texture. Medley of vegetables cooked in sweet n sour dal to make your meal nutritious and interesting. This curry can be served both as a dal and as a subzi. Sindhi kadhi, ever imagined making kadhi in a pressure cooker ?? try this recipe before you say no! a melange of veggies coated with besan and cooked to perfection in the pressure cooker. Gavarfali and bajra, the two fibre rich ingredients have been combined to make this mouth-watering delicacy. Served hot with phulkas to make a hearty and healthy meal. Sindhi kadhi showcases a rare combination of vegetables like corn, cluster beans, drumsticks, ladies finger and bottle gourd in a tamarind-flavoured gravy perked up with a wide range of spices and powders. It is indeed a delightful preparation that is sure to satiate your taste buds and your tummy! Gavarfali bajra dhokli, two fibre-rich ingredients – gavarfali (cluster beans) and bajra – come together in this delicious recipe, making it a really healthy treat! serve hot with phulkas. String and boil the cluster beans before use. Cluster beans, which have the highest fibre content of all vegetables, are not on everyone's list of favorites unfortunately! here they are cooked in an unusual spicy-sweet red pumpkin gravy that will get your taste buds tingling. This is a healthy and tasty chutney. It is also fiberous and helps in weight loss. This subji is very nutritious. a very healthy side dish for the mother. this should be had with rice. instead of chilly powder pepper is added. lactating mothers should avoid potato, raw banana, and like vegetables. Discover how to make Sindhi Kadhi using our easy to make Sindhi kadhi recipes at tarladalal.com. Share and Recommend Sindhi Curry recipes. A traditional Sindhi cuisine specialty, Sindi curry taste great with plain steamed rice. Tomato and cauliflower curry boasts of overwhelming flavors and a great taste. An Indian vegetable preparation, cauliflowers and tomatoes are stir fried together with garam masala in this delicious tomato and cauliflower curry recipe.